Friday, November 21, 2014 from 6:30 - 11:00 PM, at Starlight Theatre, Angel Flight Central will celebrate its 10th Annual Wine Flight! Wine Flight is made possible through the generosity of Doug Frost, one of only four people in the world to hold both Master Sommelier and Master of Wine titles. Doug is the founder of The Jefferson Cup Invitational, an annual wine competition where hundreds of winemakers submit their best wines for consideration by a panel of renowned wine critics. All bottles are then donated to Angel Flight Central for Wine Flight, where attendees get to sample them. Don Sumple, Executive Director, Angel Flight Central, will be happy to meet with anyone regarding this event or the Angel Flight Central organization. Information concerning Wine Flight is available at: http://angelflightcentral.org/ or by calling 816-421-2300. Angel Flight Central, Inc. is a non-profit organization recognized by the IFRS under I.R.C. Sec. 501(c)(3), FEIN#: 43-1699607. SALINA — The Kansas State University Salina Flight Team has landed the prestigious honor of being recognized as the most outstanding all-around aviation program in the country — and has the trophy to prove it. For the first time in school history, the K-State Salina team was awarded the Loening Trophy at the National Intercollegiate Flying Association's SAFECON National Championship, May 12-17, in Columbus, Ohio. The team finished 13th overall at the event. "The moment our name was called was absolutely surreal, and on top of that, we were given a standing ovation," said Tom Karcz, assistant professor of aviation and K-State Salina Flight Team faculty adviser. "The Loening Trophy is a piece of history and we can't wait to display it on the Salina campus." The trophy is made of Tiffany's pure silver and is uninsurable and irreplaceable. It will be hand-delivered to the campus where it will remain until next year's national competition. The team has 18 members, with 12 members for the competition team after a try-out process. "This event isn't just about titles and trophies. It gave our students the opportunity to network with fellow competitors and potential employers,” Karcz said. "Aviation organizations and companies from across the nation attend, too, and one of our team members even had a job interview while we were there." The flight team received support throughout the year from the K-State Salina aviation department; the K-State Salina Student Governing Association; Verna Fitzsimmons, CEO and dean of K-State Salina; individual donors; and a variety of corporations. For more information on the flight team, the competition or K-State Salina's professional pilot program, contact Karcz at 785-826-2979 or tkarcz@k-state.edu. Article and Photos Courtesy of VentureBeat. As part of an effort to begin creating industry standards for certifying unmanned systems for commercial applications within the National Airspace System (NAS), the FAA has selected FSP http://www.flightschedulepro.com/ client, Kansas State University, Salina, http://www.salina.k-state.edu, to test certification stands for small unmanned aircraft systems (UAS). K-State will use its own unmanned aircraft, those weighing 55 lbs. or less, to begin testing. Test results will help establish standards to ascertain the airworthiness of small UAS. This Agreement, the first of its kind between the FAA and a University, should help both the FAA and the unmanned systems industry to determine how standsards for small UAS should be developed. Kurt Barnhart, Professor and Head of the Department of Aviation and Executive Director of K-State's Applied Aviation Research Center, says "This project is of national important in that this could well be the first small UAS to obtain an FAA airworthiness certificate for routine opertions in our national airspace system here in the lower 48". Further, Barnhart said, "the airworthiness certificate will be most likely be developed as a "restricted" certification similar to those issued for agricultural aircraft, meaning that these vehicles would be restricted for operating above certain locations". Unmanned Aircraft Systems Program Manager at K-State, Mark Blanks, commented "Successful certification of a small unmanned aircraft system using the F38 standards as a certification basis would be a giant step toward commercial use of unmanned aircraft in the national airspace system". Flight Schedule Pro congratulates Kansas State University, Salina! Christmas......Plan Ahead......And You Could Win a Plane, Too! For pilots, flight schools and aviation enthusiasts, a Sporty's Christmas Ornament is a time-honored tradition. The 2013 etched glass ornament features the Van's RV-12. The RV-12 is a two-seat all-metal side-by-side plane. Famous aircraft designer, Richard VanGrunsven, designed the 2013 ornament and the RV-12 is also the 2014 Sporty's Sweepstakes Plane! For more information, http://www.sportys.com/sweepstakes. Sporty's Vice President, John Zimmerman, says, "We chose the RV-12 for this years ornament since Van's has more than 8,000 completed RV aircraft over the past 40 years. It's amazing that an airplane originally manufactured on a small farm in Oregon has led to a global following with RV's based in 45 countries." The custom-etched ornament includes a red ribbon for hanging, comes boxed for gift-giving and is available for $24.95. Order at Sportys.com, http://www.sportys.com/source/features/search/search.cfm?catalog=PilotShop&question=ornament, or by calling 1-800-SPORTYS (1-800-776-7897). If you haven't visited Sporty's Gift Guide, you may want to take a look. They have great gifts for aviation enthusiasts! Friday, September 27th and Saturday, September 28th, Guidance Aviation, http://www.guidance.aero/, in partnership with Tim's Toyota Center, http://timstoyota.calls.net/, and the 2013 Yavapai Fair (this year is their 100th Anniversary), http://www.yavapaifair.com/, will provide helicopter rides during "Rotors to Remember" in support of the Prescott Firefighter's Charities. The fundraising goal is $10,000.00 and 100% of all donations go directly to Prescott Firefighter's Charities, http://www.prescottffcharities.org/. Helicopter flights will take place on the corner of Main Street and Park Avenue next to Prescott Valley’s Entertainment District. 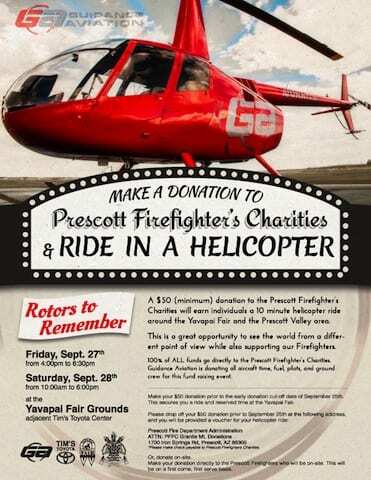 A minimum $50 donation to the Prescott Firefighter’s Charities will earn individuals a 10-minute helicopter ride around the Yavapai Fair and the Prescott Valley area. Guidance Aviation is donating all aircraft time, fuel, pilots, and ground crew for this fundraising event. “We could not have done this without our partner, Tim’s Toyota Center. They have graciously provided us an operations area and all the support necessary to conduct these flights,” remarked Dave Roy, Director of Flight Operations, Guidance Aviation. Prescott Firefighter's Charities is a group very active within the community. You'll want to be sure and come out and have some fun. See the world from a different perspective and help out a great group of people! Located South of FSP Offices, on the Kansas side, are Johnson County Executive Airport, http://jcac.jocogov.org/airport.html, and New Century Airport, http://jcac.jocogov.org/aircenter.html. Home to several FSP Clients, Johnson County Executive Airport, is situated on approximately 500 acres with a 4,100' single runway, parallel taxiways, Federal contract air traffic control tower and medium intensity airfield lighting. This airport is a very special place for me as it's the airport where my son obtained his pilot's license, (Kansas City Aviation Center, http://www.kcac.com/) and I first flew with him. It's located in the heart of Johnson County's economic belt and is the choice for many corporate, business and general aviation users. Originally constructed as a Naval auxiliary field during World War II, the Johnson County Airport Commission currently manages, operates and maintains the airport. With over 50,000 annual operations and 210 fixed aircraft, JCEA is the fourth busiest in the State of Kansas. Thinking about visiting the area, be sure to visit Full-Service FBO's Kansas City Aviation Center, http://www.kcac.com/ and Air Associates, LLC, http://www.airassociatesinc.com/.